Tomorrow comes a day too soon in Japan as Nissan has already released a load of pictures of both the USDM and JDM Cube, which is to be "unveiled" tomorrow at the LA Auto Show. This eccentric little box is vying for the same niche as the polarizing Scion xB. Japanese Cubes are powered by a 107 Horsepower, 109 lb-feet Torque 1.5L fourbanger fitted to a CVT transmission. Drive setups include front and all-wheel drive. The configurations coming to the States currently remains unknown. Check back tomorrow for the official US specifications and more photos as they roll in from our guys in the City of Angels. 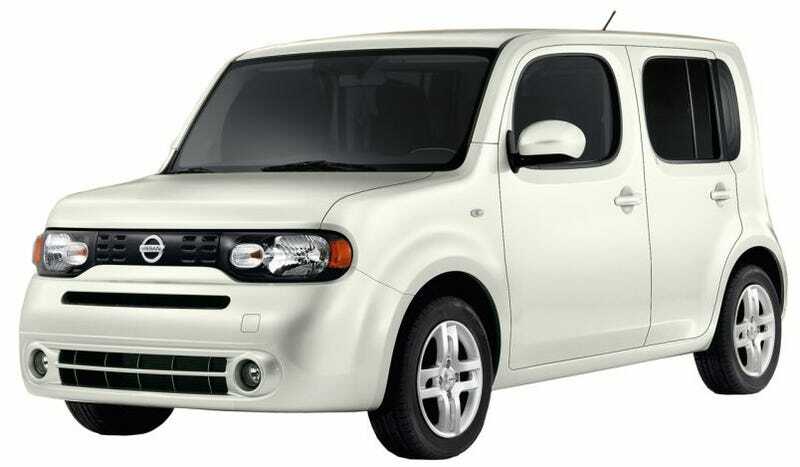 Nissan Motor Co., Ltd. today revealed the all-new, third generation of its highly successful Nissan Cube in launch events in Japan, the United States and Europe. The fully redesigned Cube continues the iconic "cubic" styling of the previous generation, adding a higher level of refinement and polish inside and out. Sales of the new Cube begin in Japan on Nov. 26, followed by North American in the spring of 2009, and Europe and other global markets in fall 2009. Originally launched in 1998, the Cube has sold nearly one million units to date in Japan. The latest version maintains the distinctive exterior styling that is instantly recognizable as the Cube, such as the asymmetric rear end, while pursuing a simpler, more universal design for its debut on the world stage. It offers greater comfort, a larger cabin and a host of innovative interior details such as sofa-like seating, a large glass roof panel that extends over the driver's seat for an open, airy view of the outside environment, and a shoji-style roof shade that fills the cabin with gentle light. Despite its increased roominess, the new Cube remains less than four meters long, providing big utility within a small physical footprint. With its excellent visibility and maneuverability, along with smooth performance and high fuel efficiency, the new Cube is a high-performance daily driver created to be enjoyed by value-conscious buyers worldwide. "The new Cube is designed for people who imagine a life less ordinary, who have grown tired of the never-ending pursuit of faster, more powerful, more outrageously styled cars," said Yosuke Iwasa, Segment Chief Product Specialist. "The quieter, more harmonious qualities of the Cube have attracted interest not only among young people, but for those in every walk of life. While carrying forward the concept of the original Cube, this latest edition has advanced significantly, including offering far greater comfort." "The new Cube is a refined car of universal quality and appeal, that can compete without 'makeup' or excessive decoration," said Seiji Watanabe, Associate Product Chief Designer. "The development concept took the approach of 'purifying' the Cube design, rather than "evolving' it. A jagged rock, for instance, loses its edges and takes on a polish as it travels down a river. This is the sort of refinement we wanted for the new Cube. We worked to simplify its exterior, using fewer lines and widening certain areas. We allowed the Cube design to refine itself, moving closer to nature and suggesting human warmth. The resulting 'purer, more peaceful' design is just what we wanted. It is a vehicle for people who are not being influenced by others, who go their own way, and enjoy interactions with friends in a welcoming atmosphere."